The Gateway National Recreation Area (i.e. Gateway) comprises over 26,000 acres in New York and New Jersey, including much of the tidal estuary called Jamaica Bay. Gateway is the oldest urban national Park and contains the only wildlife refuge managed by the National Park Service (NPS). Gateway properties also include Jacob Riis Park, Plumb Beach, Fort Tilden, the Breezy Point tip, and Floyd Bennett Field (an historical site demarking New York City's first municipal airport). Jamaica Bay is a nutrient rich estuary covering nearly 32 square miles and over 13,000 acres, and is also the largest natural open space in New York City. Located on the southwestern tip of Long Island, in the boroughs of Brooklyn and Queens, and the town of Hempstead in Nassau County, Jamaica Bay is also connected to Lower New York Bay and the Atlantic Ocean via the Rockaway Inlet. The majority of the area is publicly owned by the federal government and city of New York. Jamaica Bay is a regionally significant resource for fish and wildlife. Its waters, uplands, and barrier beaches also provide invaluable respite and recreational opportunities for the New York City metropolitan community. The bay is the frequent subject of research and management of its wildlife, fisheries, waters, and marshes. Several city parks also fall within the Jamaica Bay complex, including Marine and Edgemere Parks, and numerous smaller parcels of city owned lands. 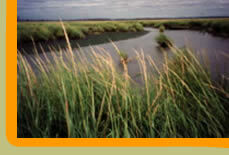 Some wetland and upland areas are part of the John F. Kennedy International Airport, owned by the City of New York and operated by the Port Authority of New York and New Jersey. Smaller upland areas surrounding the Bay remain in private, residential or commercial ownership.